Dental implants replace lost tooth roots. They are usually made up of biocompatible material called titanium and are placed in areas of the jaw that permanent supports for tooth replacements are required. Dental implants can be used to support a number of dental prostheses, including crowns, implant-supported bridges or dentures. They can also be used as anchorage for orthodontic tooth movement. For the replacement of crowns and bridges implants are ideal, as they do not depend on the alteration of adjacent natural teeth for support. In other words they replace teeth permanently and independently. Loose fitting and uncomfortable dentures can gain a significant benefit from having implants placed to offer stability. No longer will eating certain foods be a challenge and comfort levels will be vastly improved. 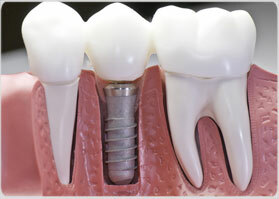 Dental implants are so natural looking and feeling; you may forget you ever lost a tooth…. They are the natural alternative. Replace one or more teeth without affecting bordering natural teeth. Provide support/stability for a denture making it more secure and comfortable.